-Learn the accompaniment part to Bach's Minuet. -Practice sight reading skills in the key of G minor. -Practice sight reading skills in drop D tuning. 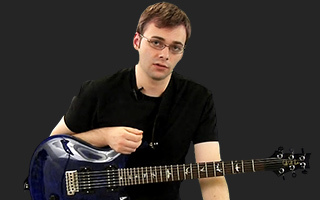 Note: In the lesson video, Matt performs the accompaniment in standard tuning. This can be accomplished by transposing the low Eb and D notes up one octave. The accompaniment part can be played in either first or second position. Perform it in both positions to determine which sounds best to you. Matt demonstrates how the accompaniment part should sound in this scene. 1. Beginning and ending the piece at the same time as they other musicians is of the utmost importance. Chapter 4: (01:23) Accompaniment Once again, sight read through the accompaniment part while Matt plays the melody line. Be confident in your counting skills! If you are unable to successfully sight read through this piece, go back and spend some time practicing it. Then, return to the play along examples and practice through them once again.